The American Civil War had yet to begin when C. F. Schrader opened a grocery store at Virginia Avenue and McCarty Street. His four sons, Edward, Charles, Christian A., and Henry, helped in their father’s shop every day after school. This is how one local multigenerational family business was born. Edward and Charles spent their careers in their father’s store. Henry and Christian A. Schrader ventured into another aspect of the grocery business. In 1883, they established “Schrader Brothers,” a wholesale grocery business operating at 70, 72 and 74 Massachusetts Avenue. Two years later, a fire destroyed the Schrader Brothers warehouse and their entire inventory of groceries. The event discouraged Henry, prompting him to leave the grocery business altogether; he moved to Colorado, where he found success in the lead and silver mining industry. His old partner and brother stayed local and gave the grocery business another shot. According to a June, 1953 Indianapolis News article, Christian reopened his business in a warehouse he rented from Benjamin Harrison– the Hoosier and General destined for the White House four years later. Business was good enough for Christian to secure a place of his own. 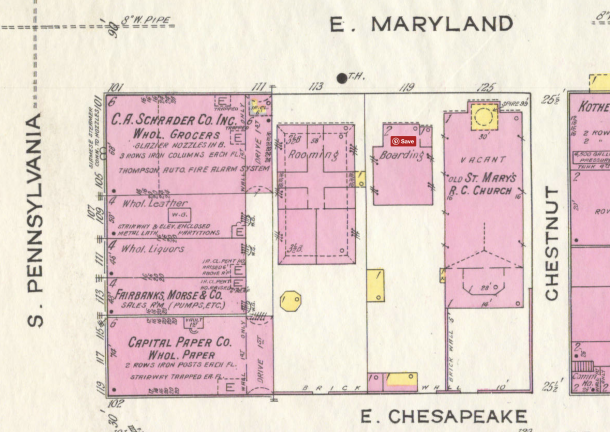 In 1898, he bought the site of an old junk yard at the southeast corner of Maryland and Pennsylvania Streets. Cyrus McCormick, inventor of the reaper and founder of what is now International Harvester, sold Schrader the property. Christian thought a more concise business name was in order, so “Schrader Brothers” became the “C. A. Schrader Company.” In 1901, the old junk yard lot yielded to the new the C.A. Schrader Building, at 101-105 South Pennsylvania Street. 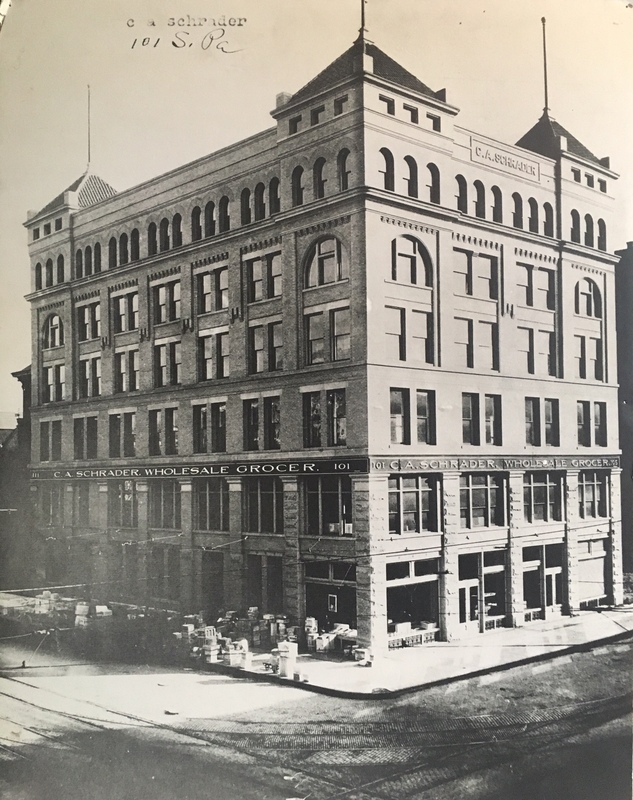 Today, the building is one of only 54 historic buildings remaining from Indy’s wholesale district at the turn of the century. Sanborn Map illustrating the footprint of the C.A. Schrader Building in 1915. The C.A. Schrader Building, a Romanesque Revival structure designed by D.A. 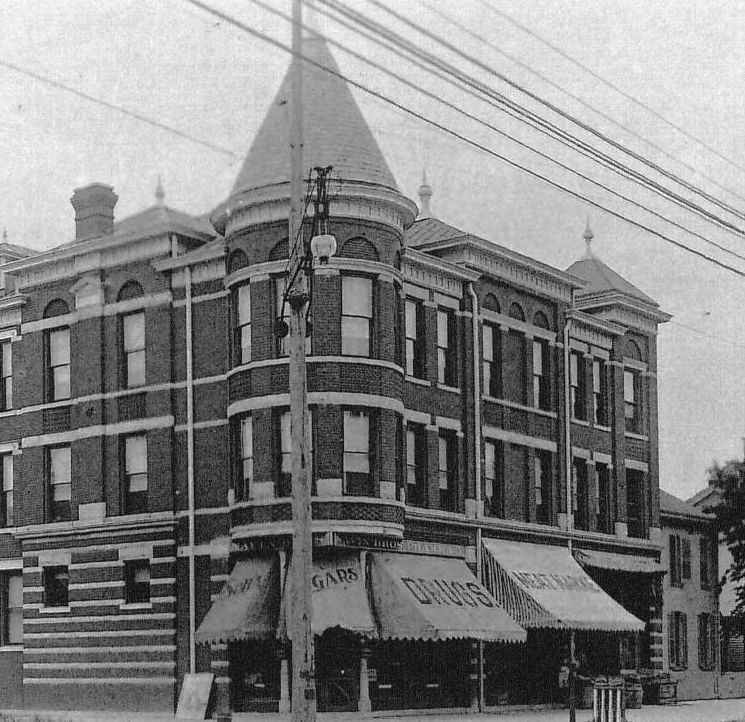 Bohlen & Son and constructed by William P. Jungclaus, was described in the 1902 Journal Handbook of Indianapolis as “one of the most imposing structures in the city,” and it is no less distinctive today. C. A. Schrader soon brought his sons, Wayne and Arthur, on board to begin a third generation of Schraders in the grocery business. In 1907, Articles of Incorporation were filed at the Secretary of State’s Office for C. A. Schrader Company “to carry on the wholesale grocery business heretofore conducted by C. A. Schrader.” And carry on they did, for more than fifty years, at 101 South Pennsylvania. Theirs was one of the prosperous enterprises in the wholesale district. In 1915, Schrader took out a newspaper advertisement offering “A pair of big mules, good ages, but street sore; will price to sell.” Other C. A. Schrader advertisements of the day touted distributorship of Budweiser Barley-Malt Syrup, 101 varieties of fruits and vegetables, and a solemn assurance that no one would be cheated by cans not filled to the top. 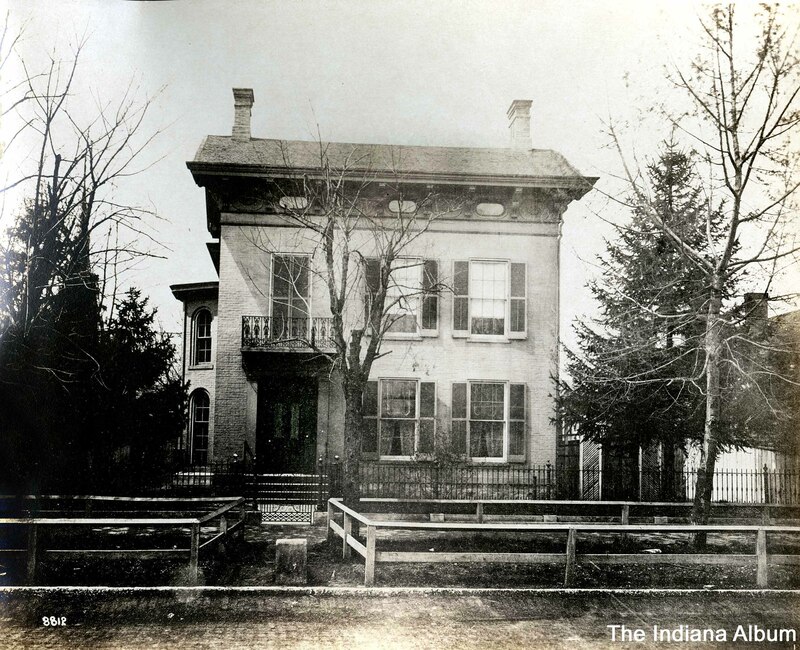 In 1924, Christian A. Schrader died of heart trouble at the family home in Morton Place, at 1936 North Alabama Street. His son Arthur took over the management of the family business. Arthur’s son, A. C. Schrader, eventually led a fourth generation of Schraders in the wholesale grocery business. As needs of the industry changed, the C. A. Schrader Company moved to a facility more efficient for a modern warehouse operation in 1953. Their new location was a brick and block building at 202 East Palmer, where their business was conducted until the doors were closed for good ten years later. The old C. A. Schrader Building, meanwhile, found new life. 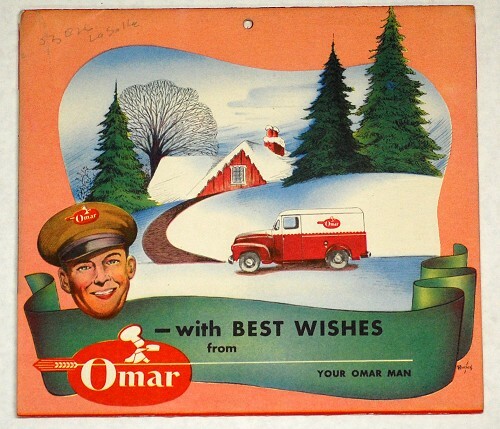 In 1954, John and C. S. Ober bought the property for use as a warehouse for office furniture, and in 1955, began remodeling the old building to become the new home of the Business Furniture Corporation, a company C. S. Ober founded in 1922. “B.F.C.” was originally located at 42 South Pennsylvania and moved to 112 East Maryland in the 1930s before relocating to the Schrader Building in 1956. The renovation included sandblasting the exterior, installing elevators, laying 15,000 square yards of carpeting, and retrofitting the ground floor with new display windows and two double entrances. The first three floors were filled with offices and the top three used for warehouse space. In 1982, Business Furniture Corporation embarked on a second restoration of the structure. This time, a two-year initiative added new showroom space without compromising the building’s architectural features. Exterior facings were acid-washed, interior walls were sandblasted, and timber ceilings and a circular staircase in the lobby were completely restored. 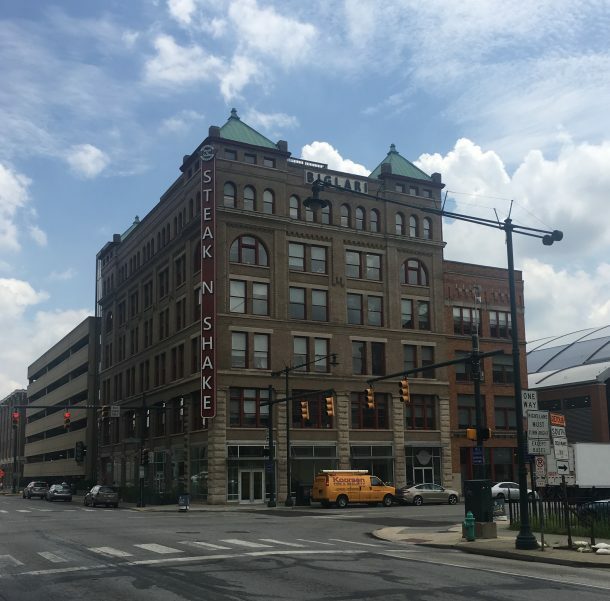 It became one of the few buildings of its size to be fully occupied by just one tenant, and in 1983 the headquarters for Business Furniture Corporation was named to the National Register of Historic Places. Business Furniture Co. name plate from its prior location at 112 E. Maryland St. 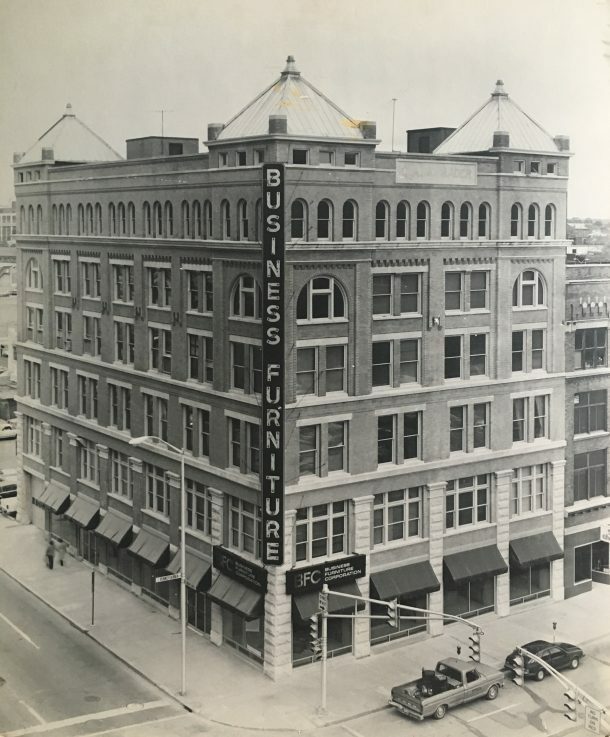 When Business Furniture Corporation purchased the adjacent, four-story Nutz & Grosskopf Building, at 107-109 South Pennsylvania Street a year later, it became part of the Schrader Building. German immigrants from Baden, Nutz and Grosskopf operated a leather business in the building they built in 1906. Leather works continued on the premises into the early 1950s. In the early 80’s, the Hunt and Chase Night Club livened up the place, but B.F.C. dialed it back down again in 1985, when it gave the building a $1.1 million makeover to accommodate a restaurant and additional office space for the furniture company. After wringing 42 years out of the Schrader building, Business Furniture Corporation moved out for greener pastures on the northwest side of Indianapolis. With that, space in the old building was available for multiple tenants for the first time in its history. Today, the C.A. Schrader Building is occupied by Ratio Architects, Inc.; a construction company; a marketing and advertising firm in the technical services industry; and a software development concern. Steak ‘n Shake owns the building and has its corporate offices on the fourth and fifth floors. The markings on the outside of the building have changed over its 115+ years. The northwest corner of the building is now anchored by a giant vertical “Steak ‘n Shake” blade. Covering the building’s original name “C.A. Schrader” is a large “Biglari” sign — so named for Sardar Biglari, chairman and CEO of the fast food chain’s parent company. The original address, 101-105, is now 101-107 South Pennsylvania. The adjoining Nutz & Grosskopf building, adopted by the Business Furniture Corporation in the 1980s, is now most recognized by its expansive southern exposure of brick painted with a schedule of Indiana Pacer games for fans filing into Bankers Life Fieldhouse.